My students are often surprised and excited to learn that I once walked the halls of our middle school as a student. In fact, I had learning experiences in many of the same classrooms as they do, sitting in what looks to be the same chairs and at the same desks. Although reminiscing offers some nostalgia, it is troubling to think that the school has not changed much over the course of two decades. Sure, there is a nicely designed, open-spaced media center that was built years after I graduated, but students only spend a fraction of their time there. This begs the question — why do the majority of the classrooms look the same as they did when I was a student? Does it cost too much money to implement changes that optimize learning spaces for students? Are there steps that we as educators can take to create more welcoming, creative and student-centered spaces? Of course, money is certainly a factor, but after assessing my current classroom, I cannot let it stop me from implementing some incremental remodeling. After all, it is only fair that I offer my students a space that supports learning theories I believe in. To better understand the scope of traditional classrooms, we must revert to the 18th and 19th centuries, when the Industrial Revolution took place. As Sir Ken Robinson, creativity mogul, so perfectly and simply states, “It’s the factory model” (OWP/P Architects, VS Furniture, & Bruce Mau Design, 2010, p. 56). If our goal is to prepare students for a future filled with uncertainty, undoubtedly looking unlike anything we could imagine, it is troubling to come to the realization that most of our classrooms continue to exemplify conformity; teachers and students maintain strict roles and risk-taking is often met with discipline rather than praise. In the most viewed Ted Talk of all time, Sir Ken Robinson states, “Many highly talented, brilliant, creative people think they’re not because the thing they were ever good at wasn’t valued or was actually stigmatized” (2006). Consequently, before we begin remodeling the layout and design of our classrooms, it is important for us to reassess what we are doing within their walls. In an article exploring what schools can learn from industry-leading innovators, Steve Turckes and Melanie Kahl pose the question, “What would it mean for schools to have a culture centered on design thinking and interdisciplinary projects instead of siloed subjects?” (2011). In an ideal situation, this would certainly require a macro-strategy by school districts as a whole; however we can still implement changes within our own classrooms that embody this sentiment. That said, below is my vision for redesigning my middle school classroom. By looking at the current photos, you will notice the walls are lined with desks and, when working on their computers, students sit, staring at the wall — not the most inspiring view. Besides the fact that the desks are positioned in a way that does not support collaboration, they are completely outdated; they include a fixed keyboard tray for old desktop computers. 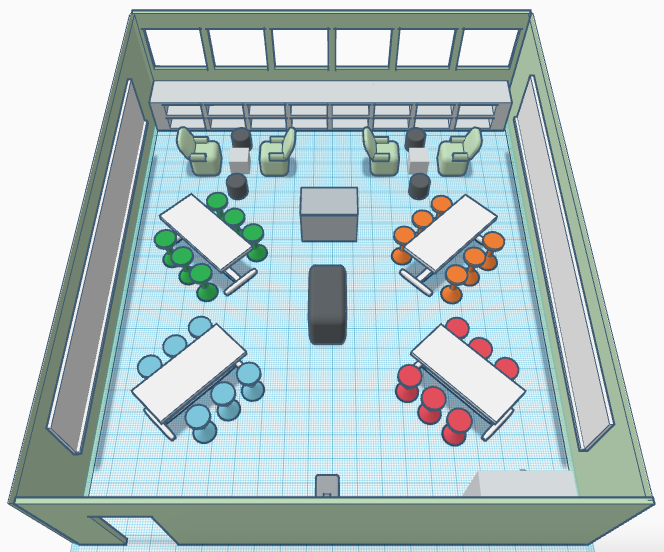 Therefore, my first and most pressing redesign measure would be to replace the desks with four, six-foot, height-adjustable tables, as displayed in the 3D models above. My students have boundless energy, so providing them with stools where they can choose to sit or stand will provide them with flexibility to work more efficiently (notice the positioning of the tables — diagonal to allow for better flow and less conventionality). Additionally, there are three desks in the middle of the classroom, and I would leave all but one as a teacher workstation. If I could not find unused tables at the school, these updates would cost approximately $2,500. One wall of my classroom is currently lined with a chalkboard, while the other has a cork board — neither of which are used effectively. Instead, I would replace both with dry erase boards, allowing students to use them for planning, brainstorming or however else it helps them free their creative spirits. I would also line the tops of the tables with dry erase boards to foster further creativity and ease of brainstorming and collaborating at any time. Magnetic, dry-erase boards for the side walls would cost approximately $400. The current projector I use is one that most likely existed when I was a middle school student, yet there is a new projector that was installed a couple of years ago, on the front wall of the classroom. Unfortunately, even though it was installed, it was never properly initialized, which has led to me to continue using the older model. I would rid the old projector and take the necessary steps to set up the new one. Although it is not as pressing, I would love to have two lounge areas available to students, with four single arm chair couches and four round ottomans, costing approximately $600. Luckily, my classroom has plenty of natural light and built-in shelving available for storage. Reassessing my classroom space has inspired me to begin making my vision a reality. It begins with a conversation with key stakeholders (i.e., my building administrators and supervisor), but it is time my classroom reflects the teaching methods I believe strongly in. While the cost of equipment is a factor, the cost of continuing to model our learning spaces from the 18th century is far more prohibitive. 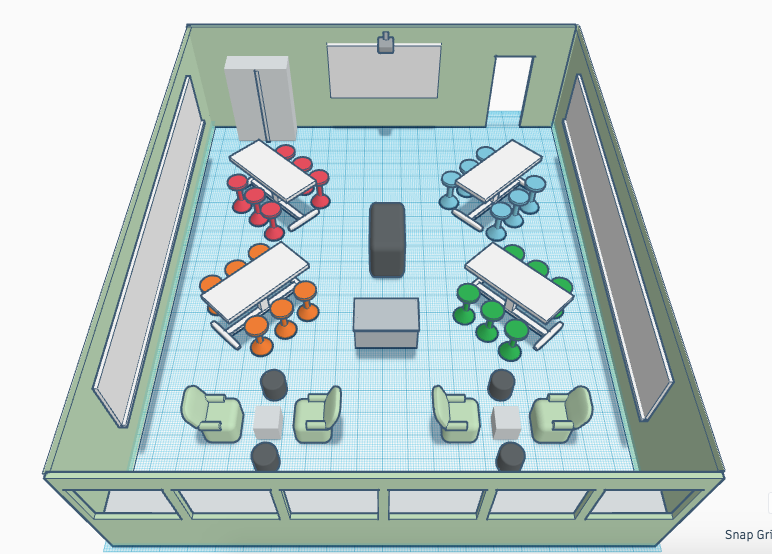 Have you considered redesigning your own classroom? Feel free to comment below — I would love to hear your thoughts, opinions or concerns! We have a tendency to blame a lack of creativity on laziness or apathy and, while they are certainly factors, oftentimes we just can’t seem to place a finger on why we can’t come up with an innovative idea. What’s even more baffling is that, it’s as if the smarter we become, the more rigid our views on everything around us become as well. There’s a term for this — Functional Fixedness — the cognitive bias where individuals see objects used only in their traditional sense. Functional Fixedness places a stranglehold on perception and hinders the ability to think creatively. In my graduate course, CEP 811, this week class focused on exploring the idea of repurposing and its implications on creativity and educational technologies. In an engaging and thought-provoking keynote presentation, Dr. Matthew Koehler, professor of educational psychology and educational technology at Michigan State University, and Dr. Punya Mishra, co-director of the Master's in Educational Technology program at Michigan State University, explain that creativity is “easy to recognize, but hard to define” (2012). We’ve all heard the overused statement urging us to 'think outside the box,' yet how do educators utilize educational technology to creatively construct meaningful activities for students? Ironically, “there is no such thing as an educational technology;” we create it ourselves (Mishra, 2012). In 2012, Eric Rosenbaum and Jay Silver surprised the crowdfunding space, raising more than $500,000 to fund an invention kit they developed called Makey Makey. They claimed the kit would “turn everyday objects into touchpads and combine them with the internet.” By simply combining a circuit board, USB cable, a few wires, alligator clips and everyday objects, Makey Makey breaks the barriers of Functional Fixedness. Still not drinking the Kool-Aid? Search “Makey Makey” on YouTube and you’ll find tons of individuals who have explored the world around them and created inventions out of the wildest objects. Take these for example: a compilation of Makey Makey music inventions, a Makey Makey video game controller, or even a way to make a carrot scream when being sliced! Adding myself into the mix, throughout the week I explored my own Makey Makey kit and invented a way to help reinforce training methods with my puppy, Lucy (you may recall my training endeavor from CEP 810). Last week, my fiancé, Samantha, and I were visiting her cousins’ house and happened to see that they were getting rid of an old rabbit pen. The idea struck me that we may be able to repurpose it in our apartment as a way to partition the living room from the kitchen (it has the ability to be situated into different shapes), giving Lucy a sizable, controlled space to roam around without getting into too much trouble. The only issue is, since she is a bit hyperactive, she often jumps on the counters and gate, which is something we’ve been trying to curtail. What better way to help reinforce her training than to invent a way to teach her when we’re not in the room ourselves? This is where my Makey Makey comes in! If you’re interested in trying something like this for yourself, all you’ll need is a Makey Makey kit ($49.95), aluminum foil, 28-gauge aluminum or copper craft wire (thinner wire is more flexible), tape (conductive tape helps if you have it), and basic computer programming knowledge. As seen in the video, I began by first creating a program in Scratch, a free website that allows users to program interactive stories, games and animation. The website uses a form of click-and-drag block coding, so there’s no need to have prior computer programming experience. Of note, the website includes a wealth of step-by-step tutorials, which are an incredible way to introduce yourself and/or your students to programming. After recording myself saying, “Lucy, off,” I created a simple command so that when the space key is pressed, the recording will sound off and count the amount of times it occurs. Below is my Makey Makey setup. The red cable plugs into the USB port on my computer, the yellow wire connects the space key to the foil on top of the gate, and the green wire connects earth to Lucy. Therefore, when Lucy touches the foil, it closes the circuit and runs the program I’ve created, prompting the recording to sound. I also repurposed Lucy’s harness using some aluminum foil, conductive tape and craft wire. This took a few tries to get right since I had to make sure that the foil was touching Lucy's body. Next, I connected wire to the foil, wrapped it around the rings of the harness, coiled it around the leash and ultimately connected it to the Makey Makey. The clip on her leash is metal so I knew that once it touched the rings, it would close the circuit. Lastly, I made sure to tether the leash to her crate to avoid my laptop from being destroyed if she tugged. Below is a video that further explains. Although this activity was challenging to say the least, I thoroughly enjoyed the process of creating this invention; it certainly brought out the inner-child in me. I now understand why and how Makey Makey can completely revolutionize learning for students. As I was tinkering with my kit, I was going through the steps of the Engineering Design Process, first defining the problem I was trying to solve — to prevent Lucy from jumping on counters and gate — along with constraints, then moving on to exploring, planning, creating and ultimately improving the invention to be more efficient. With my Intro to Engineering students, Makey Makey can take design challenges to the next level. Furthermore, by integrating computer programming, it can urge students to think critically, sequentially and creatively, fostering invaluable skills in a fun and playful manner. The sky's the limit when it comes to what Makey Makey can offer students and, as I’ve learned, it’s up to educators to provide them with the tools necessary to become innovative problem solvers. In this case, all we need is a Makey Makey kit and the world around us. In my CEP 810 (Teaching for Understanding with Technology) course, the initial assignment tasked students with writing an expository essay that responds to two key questions regarding learning. The essay (full version here) contains my analysis of what learning is defined as and what teaching methods support learning and its related concepts -- understanding and conceptual change. Upon reading the first three chapters of “How People Learn: Brain, Mind, Experience and School,” I have gathered specific evidence to support my response to the given prompt, exploring how learning is a comprehensive process that encompasses the transfer of knowledge and skills, and translates into understanding and the ability to make real-world connections. Moreover, I stress that collaboration, goal-setting, reflection, autonomy and digital productivity tools support an optimal learning environment. I appreciate you taking the time to explore my insights. Please feel free to share your comments below!